What the blazes is going on with barn fires? Canadian Underwriter	What the blazes is going on with barn fires? What the blazes is going on with barn fires? If Ontario insurers want to reduce the risk of huge barn fires, they might want to consider advocating for the removal of an existing exemption for mandatory fire inspections of farms that is contained in the province’s Fire Code. As it stands right now, mandatory fire inspections of farms are linked to land occupancy and not property, a panel told delegates attending the Ontario Mutual Insurance Association annual general meeting in Toronto Thursday. That restricts the ability of officials to inspect barns for potential fire hazards. The exemption exists because of a greater focus on inspecting structures that could potentially threaten more human lives. But the effect of the exemption is to restrict fire inspectors from reducing the risk of costly barn fires, said panelist John Elston, a fire prevention officer in the County of Middlesex in southwestern Ontario. Barn fires are of increasing concern to insurers, including mutual insurers, in Ontario. While the frequency of barn fires in the province has decreased slowly over the past decade (from more than 180 in 2008 to just over 140 in 2017), the severity of the losses has increased per incident. In 2008, for example, 184 barn fires resulted in a collective loss of $30.3 million (or about $163,000 per fire). In 2014, 150 fire incidents led to a $28.4 million loss, or about $190,000 per fire. The losses are more severe because the increased cost of building materials such as wood and metal. Plus, the value of livestock has increased, partly because more animals can be housed in contemporary barns. The building code for Ontario farms has not been updated since 1995 (changes are due in 2023-25, panelists noted). In the meantime, farmers have been building progressively larger barns, including more storage for heavy farm machinery (such as combines), equipment (robotic milkers, for example), and electronics. “The barns are bigger, so there will be bound to bigger [losses],” Elston said. 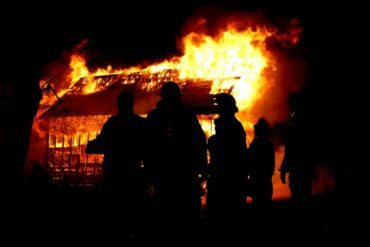 Forty per cent of barn fire losses result from faulty electrical wiring, according to the Ontario Ministry of Agricultural, Food and Rural Affairs (OMAFRA).